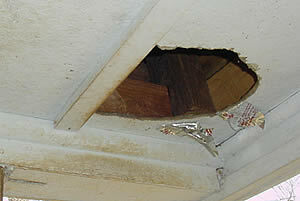 Wildlife intruders damage many areas of a structure when seeking access to shelter. It is not uncommon to see siding penetration or soffit damage, often caused by animal chewing. Once living inside your home, the wildlife intruders may cause damage to other areas such as the electrical wiring, insulation or drywall. There are multiple ways that animals can otherwise adversely affect the structure of a building. Stopping the damage is only half the solution. After your wildlife problem has been identified and resolved, repair work needs to be initiated promptly to avert further infestations. Most repairs are minor in nature and can be completed quickly and efficiently. However, if animal damage is more in-depth, it may require more extensive rebuilding of the area. Each situation is unique and we will custom tailor our recommendations to address your specific problem. We always recommend a permanent repair to complete the project as delaying repairs only invites wildlife to return again. The Wildlife Management Professionals at A All Animal Control know how to remove the intruders and effect repairs so that wildlife does not regain access to your home or business. Our team of repair professionals will provide a warranty of their work for your protection and peace of mind. Extended warranties are also available for additional protection. We have successfully repaired thousands of homes and businesses, so you can be assured that we have the experience it takes to finish any project. Contact A All Animal Control today and we will be glad to assist you with management of your wildlife problem and minor carpentry, soffit, and fascia repairs.